Reading and discussing about Organic food is the first half of a story whereas actually buying , tasting , appreciating and getting addicted to Organic food is the second and most exciting part of the story. I came across Organic food some 7 years ago and accidentally came across a store selling Organic food in Hyderabad about 4 yrs ago, for the first time in the form of ‘Natures Basket’. Having read about the benefits of Organic food , I walk into the store and find that all the veggies and fruits were shrivelled and the quantity was very less. I was excited about buying a lot of stuff but was disappointed . 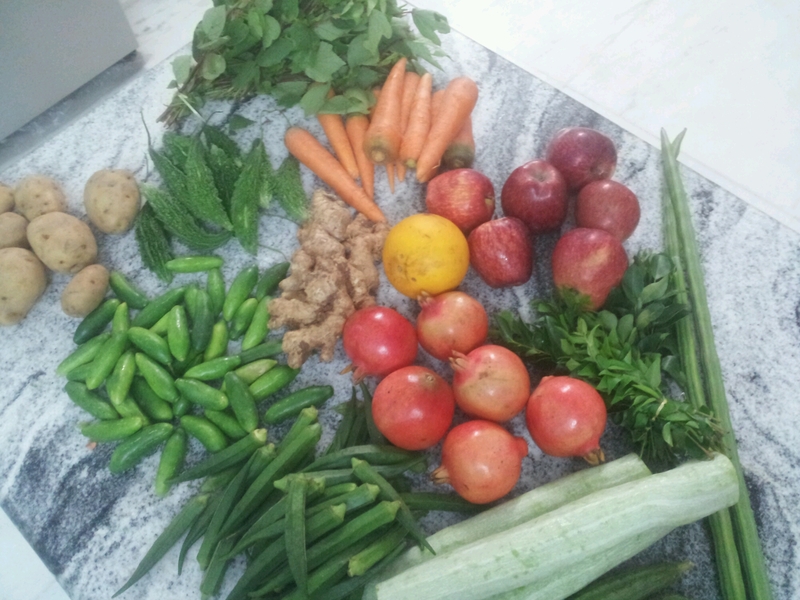 Bought some other groceries like dals .The store was far from home and hence was conveniently forgotten . 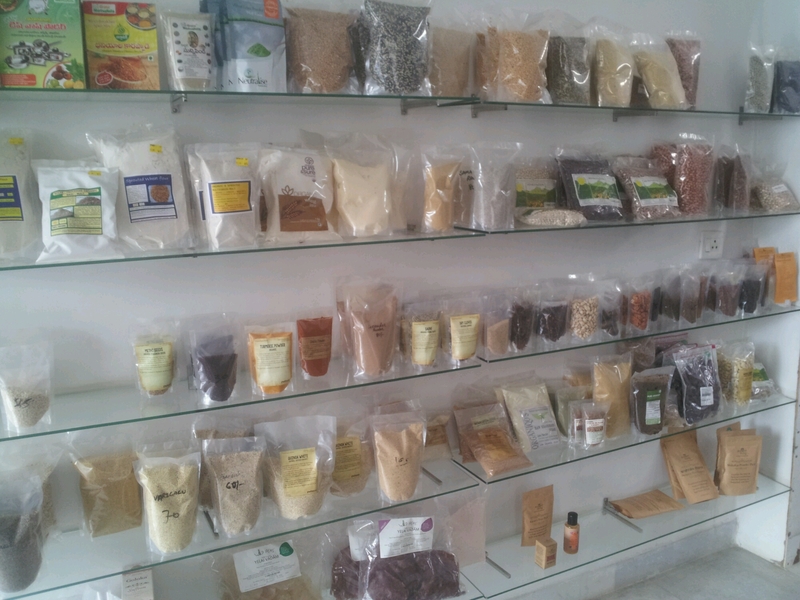 Come 2016 and I suddenly start searching the net for other Organic food stores in Hyderabad. Was glad to see that a lot of stores were open. 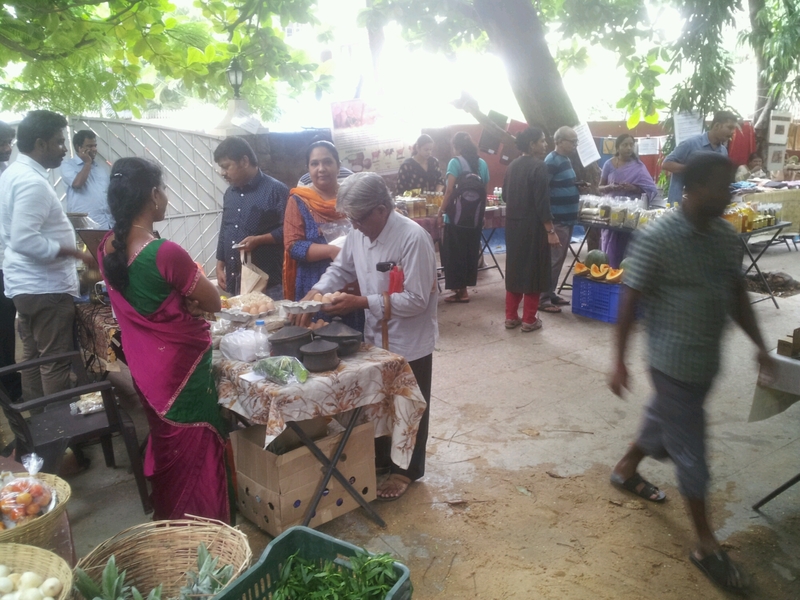 Read about Organic Bazaars at Saptaparni , Lamakaan, Hyderabad Goes Green, Sristi Naturals, Sacred space etc. 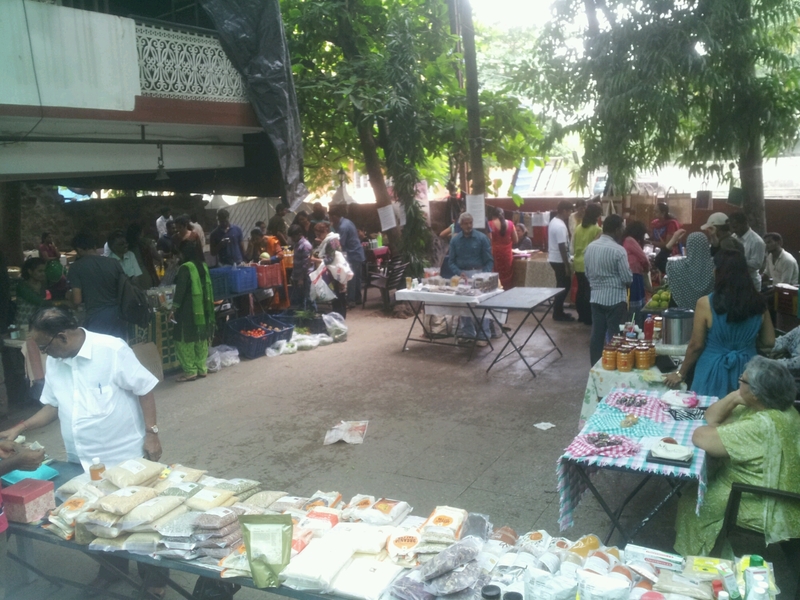 Visited the Monthly bazaar at Saptaparni, Banjara Hills and loved the atmosphere and variety of products. Veggies, fruits, Dals, cold pressed oils, mud vessels, honey, millets, handicrafts, hand made jewelry, jute bags, soaps (vegan), shampoos and many other items are available.They do appear fresh and look good too. I was happy but then the doubting mind starts questioning whether the products are genuine . They are expensive too, almost double the price of the regular stuff. I did buy a few veggies hesitantly and found that they did taste good . I continued reading about the other stores. Landed at Lamakaan , Banjara Hills on anothet Sunday. They had similar stuff like in Saptaparni. Saw lots of people buying stuff and carrying big bags full of groceries. My confidence levels on the authenticity of the wares increased. I bought many more veggies during this visit. I also bought a few varieties of dals , tamarind and a hair shampoo bar. I usually end up throwing away a few veggies in the refrigerator once in a while but this time I made sure not a single vegetable was wasted. I wouldn’t allow my cook to do the cooking and I would prepare the curries myself 🙂 . I wanted to wash , cut , smell and taste the expensive veggies myself . I liked the taste and flavors. Lamakaan and Saptaparni are far from home and I wanted to visit more often but was unable to. I had joined a group ‘Organic Meetup’ on FB, sometime ago. A few days back I saw a post with the address of an Organic food store closer to where i live. It is named ‘Goodseeds’ . I wanted to go there the next minute. 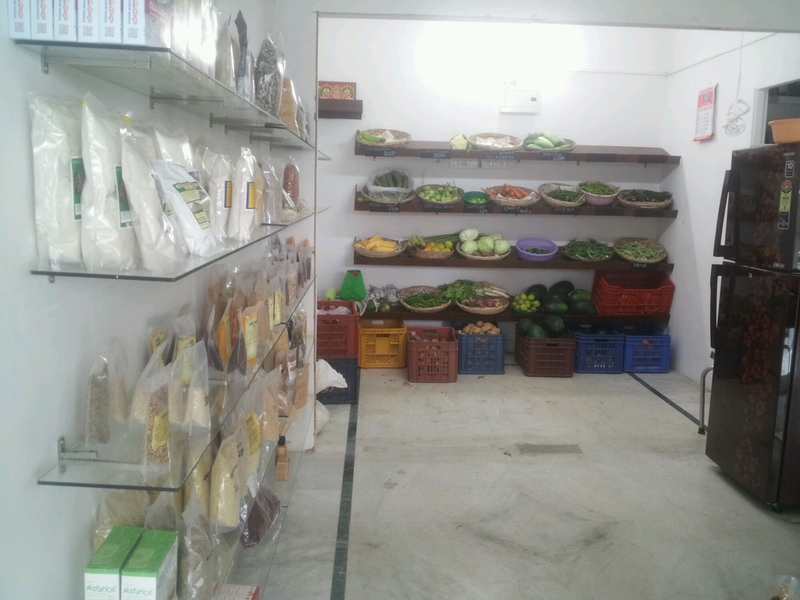 Went there directly from work and entered this neat little store with several packets and veggies placed on the shelves on the walls.I spent some time looking at each one of them.Though the atmosphere is incomparable to the lively atmosphere at Saptaparni and Lamakaan , I was pleased with the items that are available here.There were a few veggies and I was told that new stock will arrive the next day. I pick up a few veggies , virgin coconut oil , millet ravva , chia seeds and apples. I am back the next day and pick up cinnamon and more veggies. I no longer want to buy groceries at the regular supermarkets. I am thoroughly enjoying the taste and flavor of Organic food. I am now addicted to Organic food!! The lady managing this store added my phone number to her whatsapp group and sent a msg as soon as new stock arrived. This was the grocery haul. For the first time in three decades I tasted original Shimla apples which crispy and have a sweet fragrance unlike other imported ones that have flooded the market. For the first time in decades I was able to taste authentic cinnamon that is sweet. Memories flashed from childhood days when I would love to chew a small piece of cinnamon while mom was cooking and had placed a few pieces on the kitchen counter. These were very neat and clean too. My morning ginger + cinnamon tea now tastes very sweet and I need not add honey to it . Been ages since I smelled the typical sour flavour of dosakaaya (cucumber) while it was being cooked. I like the shampoo bar too. It is vegan and made of soap nuts and vegetable oils. I finally started cooking with cold pressed coconut oil and the curries are yummy. I plan to prepare Avial one of these days 🙂 . Categories: Organic food | Tags: goodseeds, groceries haul, Healthy Living, Hyderabad, lamakaan, Organic food, organic stores, Saptaparni | Permalink.